On Wednesday I got an email from the event giving me the pre-race logistics. "That's funny," I thought, "Did I actually sign up for this race?" So I searched for myself on the event site and saw that I had a bib number assigned to me. My first reaction was, "How can I get out of doing this race?" I had just started a 10k training plan and had, as a matter of fact, done a my second hard workout of the week; an anti-taper, as it were. I checked the policy and while they don't allow refunds or transfers, they will let you defer your entry until the following year for a fee. The fee was almost a third of the actual race entry, but I didn't feel like I was prepared for the race. Now, don't get me wrong, it's not that I felt under-trained, but rather, I was literally in the middle of a training cycle and my body was purposely on the border of exhaustion. As a result, I was nervous that I would have a repeat of last year when I bonked on the run. In the end I couldn't defer my entry as I had missed the deadline. After some encouragement from my wife, I called my in-laws and asked them to watch Ellie for the day and they were happy to do so. 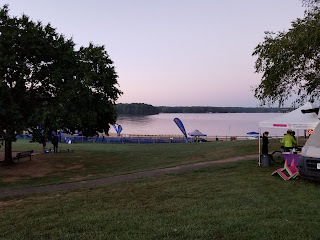 And so on two-day "taper" I did the race. It started an hour earlier than it did last year, so I was out of my house at 5am to make the 8am start time. I ate my normal race-day breakfast, which consists of a bread (today it was a Sandwich Thin), peanut butter (or in this case almond butter), honey, bananas, and coffee. Not wanting to bonk like last year, I doubled up my breakfast, but I ate the other half in the car. I also actually had some gels this year as well. The gels, along with the rest of my gear was set up in the transition area by 7:20 so I had plenty of time to get myself all worked up about the race (it's pretty funny turning my HRM on and seeing my heart rate spike to 100+ even though I'm not doing any physical activity). The lake temperature was 77° which meant it was wetsuit legal. Not that you need a wetsuit at 77°, but I was not about to pass up that advantage, so with about 15 minutes before race time I suite up. As I was waiting on the beach and literally getting my feet wet (warm-ups are for suckers, or people who are actually good swimmers) a yellow jacket decided the inside of my wetsuit would be a grand place to chill. I was not so chill, and if I had my HRM turned on at that point, I'm sure I would have seen a precipitous spike in my heart rate. I'm not even allergic to bees, and I haven't been stung since I was about 7 years old, but I still have an irrational fear of stinging insects. Eventually the bee did leave me alone, which was great, because it was about five minutes before the race started, or at least before the collegiate athletes started. My wave wouldn't start until four minutes after the college kids. Which, just as an aside, it is so odd seeing that many young kids at a race. The normal population for triathlon is decidedly older so it's kind of refreshing to see all those whippersnappers taking on the sport. And of course, there are some beasts among them. As for the race itself, I won't go into much detail. I felt really good in the swim. It is obviously a lake swim and it goes out 700 meters, over 100 meters, and then back 100 meters to the shore. I thought I sighted well and I felt like I had a good cadence. Apparently I was a little too comfortable though, because I came in about 30 seconds slower than I did last year. The transition was nearly the same as it was last year, except there was nobody offering assistance with wetsuit removal. Not that I took it up last year, but I was considering it this year. However, being a sleeveless wetsuit, it is relatively easy to take off. My transition time was essentially the same as it was last year. Last year, I forgot to open the velcro straps on my bike shoes, which I had clipped into the pedals already. This year I would not make that same mistake, and while my transition time last year wasn't impacted (because I didn't notice the mistake until I was out of transition), my bike time suffered a bit. This year, my bike time did not suffer and I improved by almost five minutes on the 24 mile course. I had two gels on the bike, which was actually a lot more difficult than I thought it would be. The course was super hilly, and there was no way I was going to go through the motions of pulling a gel out of my jersey pocket, open it, eat it, and put the refuse back in my jersey pocket while I was in the aero position, so I had to wait until I was going uphill, but then I was going uphill. And of course, as soon as I ate one of my gels, I got passed by two guys I had been jockeying for position with for quite a while. My next transition was a 12 seconds slower than last year, most likely because I stepped on a rock as I was traversing between the road and the grassy transition area and hobbled the rest of the way as a result. The run course is just mean. It's two loops and you start each loop going uphill. Like, way uphill, for what seems like forever. Thanks to the magic of barometric altimeters in GPS watches, I can actually quantify "way uphill" and "forever." It's 100 feet of gain in 7/10 of a mile, which is a 3% grade apparently. Trust me, it feels way worse than that. Last year, I did great on the first loop, but I bonked on the second loop. That hill just killed me. I was terrified that it would happen again. Coming off an hour+ bike effort and then going up hill to start the run is a great way to confirm the fears that you are in fact going to bonk again. Luckily, I had a gel with me this time, which I held on to like it was a silver bullet. So of course, it fell out of my tri suit pocket about 5 minutes before I was ready to use it. Luckily, it was at a point in the course that doubled back on itself, so I was able to pick it up on my way back. The plastic had punctured and it was slowly leaking, so I just took it then. The run course is mostly road, but it takes you on a path through the woods leading back to the lake. It was on that path that I had my second wildlife interaction as a black snake was crossing the path. It was spread about 3/4 of the way over the path. Not taking any chances, I leapt over it and continued my decent to the lake. I took this as a bad omen (are there any other kinds of omens?) that I would have difficulties on my second lap. And difficulties I had. I wasn't able to maintain the arbitrary pace I had decided I wanted (7 min flat), but I also was not close to bonking. I finished the run a few seconds under 44 minutes, which meant that I broke 2:30 for the entire race (by three seconds). I actually couldn't remember at the time what my times were from previous years, but being so close to that milestone time, and being under it felt really good. As it turns out, the time was objectively good (for me) as I beat last year's time by 17 minutes, and the year before that by 15 minutes. After I took a couple of minutes to collect myself and down a bottle of water, I showered, cleaned up my transition area, and then ate a delicious personal pan pizza. Nothing is quite as nice as eating some empty calories after a race like that. 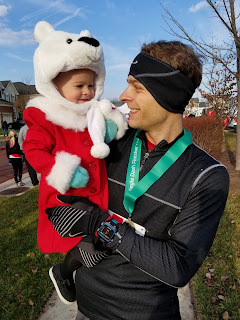 After all of this, I'm really glad that my wife convinced me to do the race, despite not feeling ready for it. Though, I can't even imagine how upset I would have been if my time had been 2:30:01 instead of 2:29:57 - I would have been blaming my lack of taper for years to come. I'm really glad I don't have legitimate complaints about in this race - it was really well put on. I guess if I had to complain about one thing, though it would be the strength of the competition. I placed 5th in my age group out of 24 and 63rd overall out of 372. 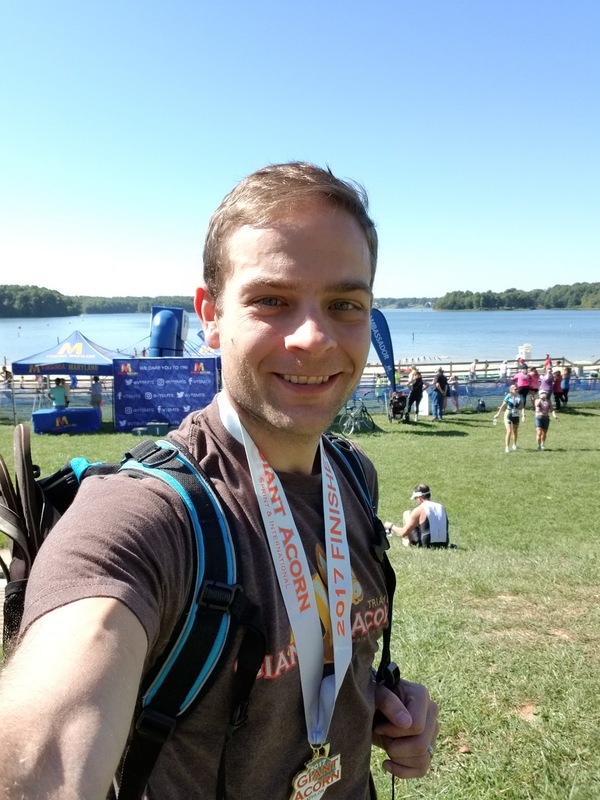 Based on my performance compared to others, the run was my strongest event, the swim was by far the weakest, and the bike was also pretty strong (46th place, 112th place, and 61st place, respectively). Maybe I'll sign up for this race as soon as the registration opens again, just like I did last year, but properly prepare myself for it.